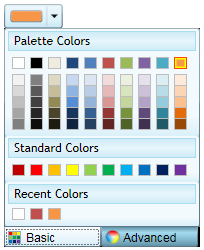 Using ComponentOne ColorPicker™ for WPF, select colors from professionally-designed palettes, or build your own custom colors with support for transparency. 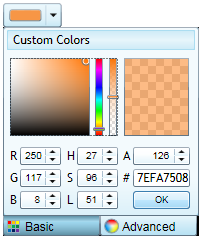 ColorPicker contains more than 20 predefined color palettes that match the themes used in Microsoft Office. The colors in each palette complement each other, and they can be used to create applications with a polished, professional appearance. ColorPicker includes a color editor. This editor enables end users to create colors that are not on the current palette using the RGB or HLS color models with support for transparency. Because ColorPicker for WPF supports ComponentOne ClearStyle™ technology, you can easily change control brushes without having to override templates. By just setting a few brush properties in Visual Studio, you can quickly style each part of the control.